I love samosas but making them from scratch takes way too much time. So I cheat and make a samosa and spring roll! 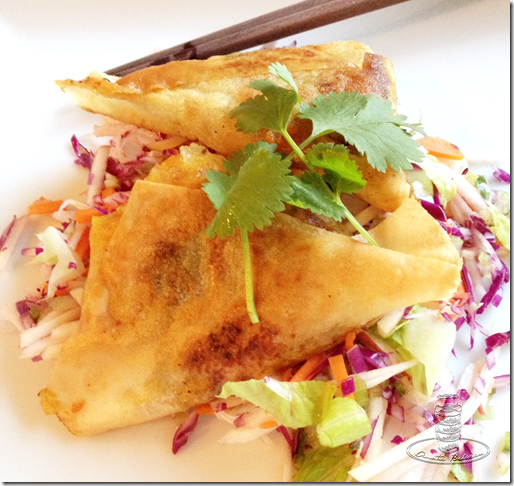 These samosas are super crunchy and come together fast! I use spring roll wrappers to make these amazing Sweet and Crunchy Banana Spring Roll Desserts. Folding samosas might seem challenging but it’s actually really simple. With a little practice, you can turn these out in minutes! Cut spring roll wrapper in half. Place about 1 tablespoon of filling on each wrapper and fold as instructed (see photos above). When oil is hot, gently place samosas in pan and fry both sides of the samosas until golden. About 2 minutes on each side.